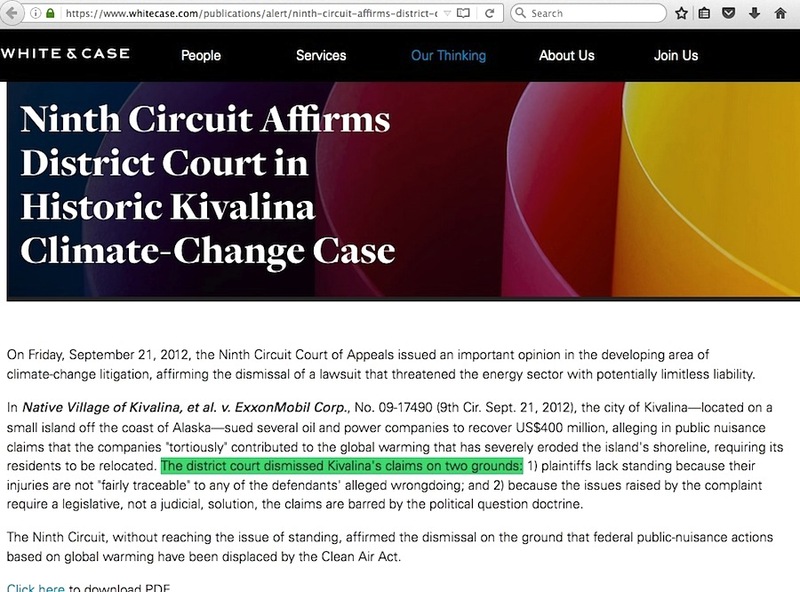 With regard to the most recent series of municipalities suing energy companies to recover the ‘costs of man-caused global warming,’ never forget that these lawsuits are built on two premises: 1) “settled science facts” and 2) “industry-paid shill scientists following an industry-created conspiracy goal to cynically reposition global warming as theory rather than fact.” In a sinister way, no less. The presiding judge in the CA v. BP Oakland version of twin California lawsuits just indicated that there is no evidence for the conspiracy accusation. 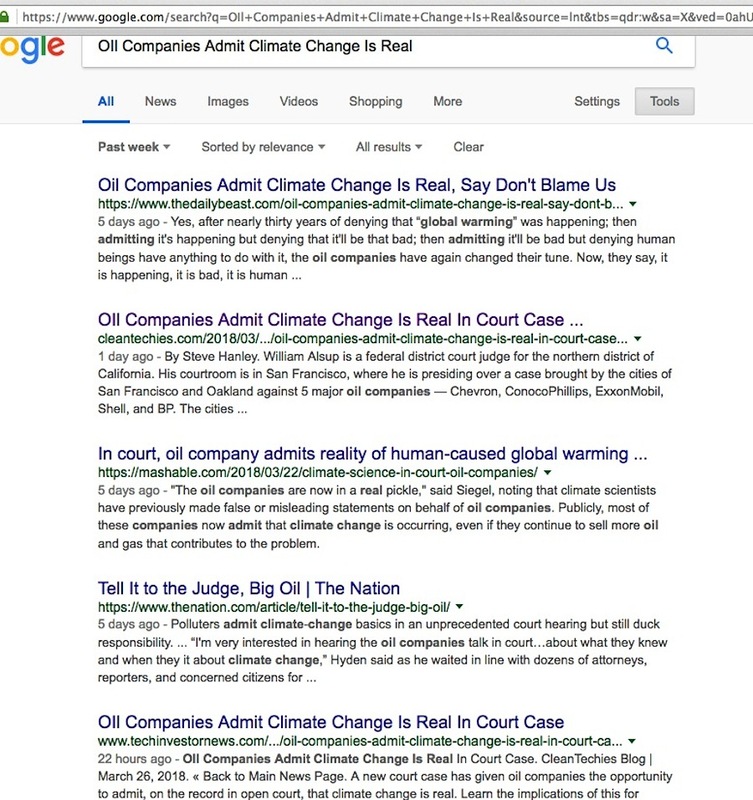 This spells doom for the other People of the State of California v. BP P.L.C. et al. 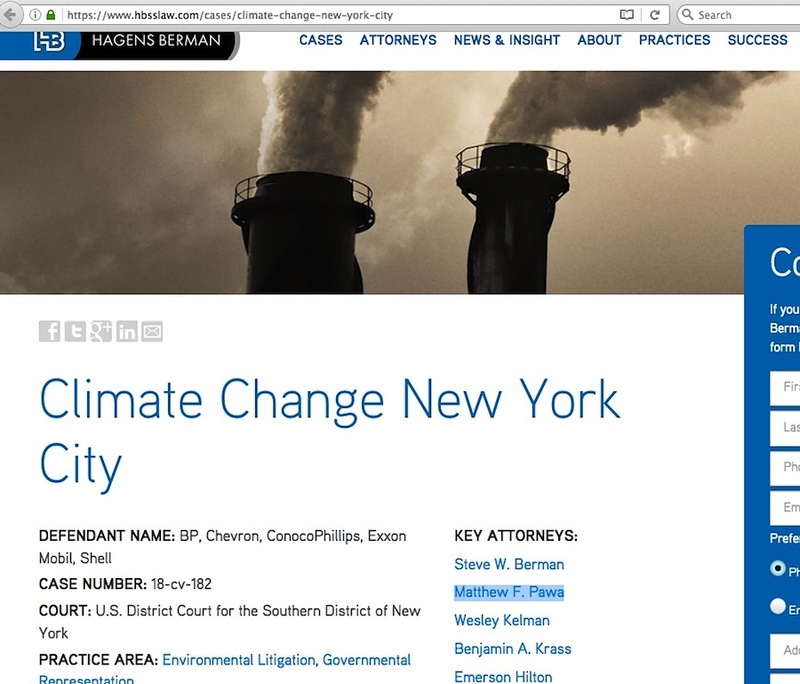 San Francisco Superior Court Case and for the City of New York v. BP case. In this post, I’ll explain how that is. 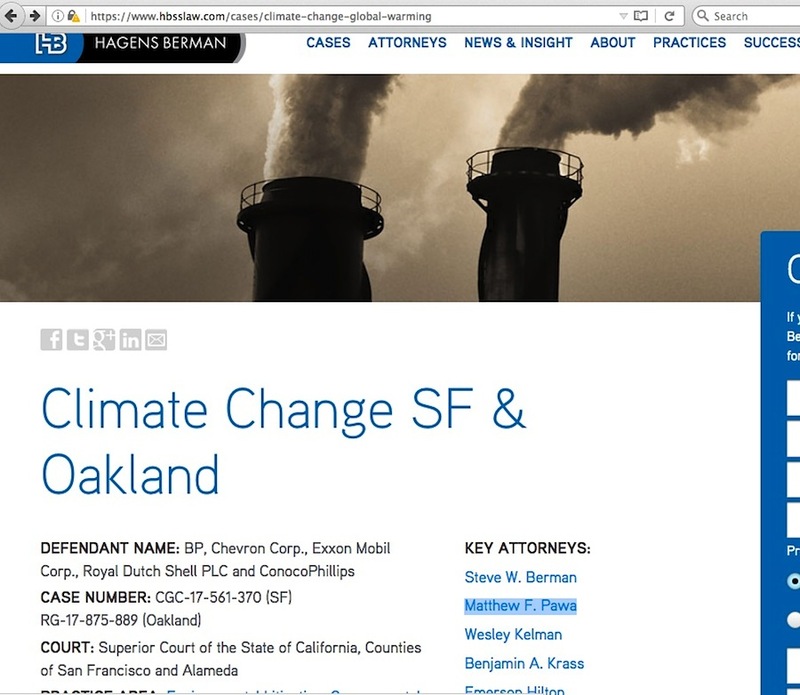 In September 2017, San Francisco and Oakland filed lawsuits against fossil fuel energy companies, “blaming them for the effects of climate change.” In an unusual development, the judge in the Oakland case asked in early March 2018 for a tutorial from plaintiffs and defendants about predominantly science points. 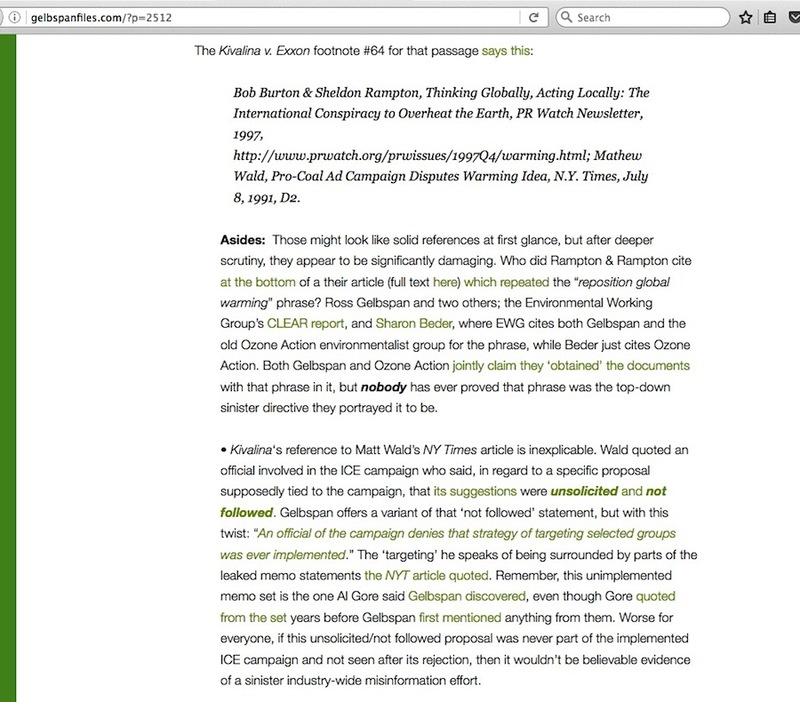 The judge’s eight questions are seen here, and people such as Lord Christopher Monckton and his associates went into considerable depth answering those science points here and here. 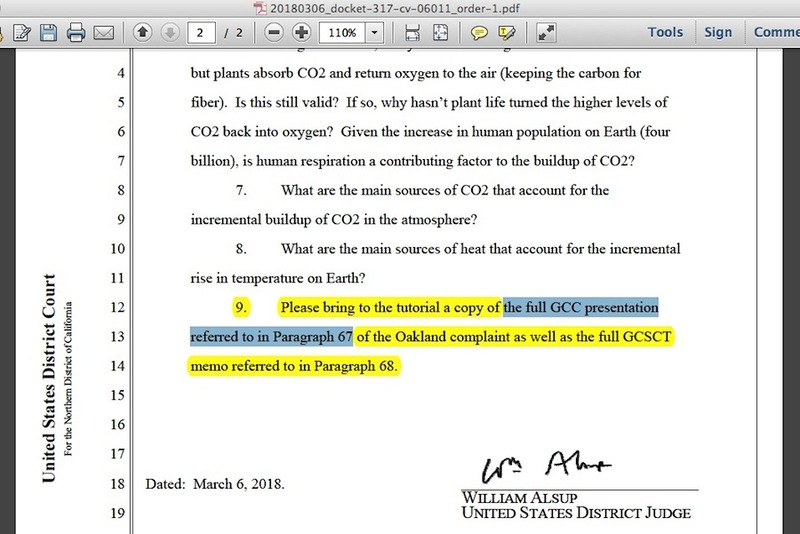 Please bring to the tutorial a copy of the full GCC presentation referred to in Paragraph 67 of the Oakland complaint as well as the full GCSCT memo referred to in Paragraph 68. 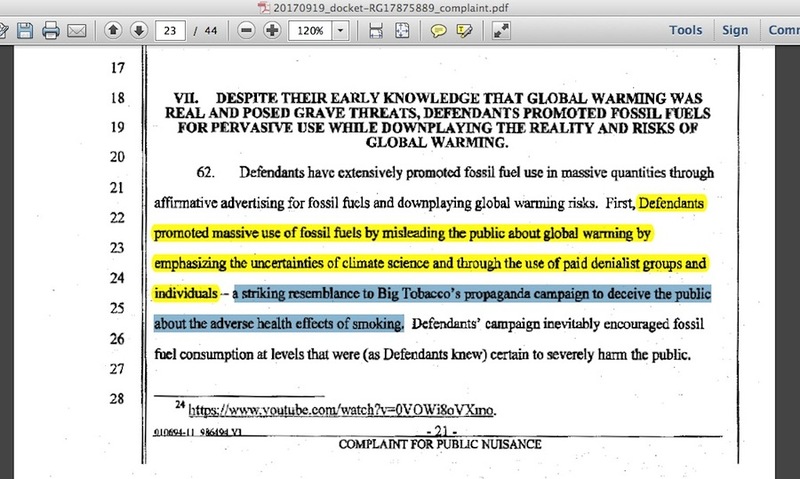 The Oakland case (and its twin San Francisco case) devotes its sections four through six to the assertion that the science of man-caused catastrophic global warming is settled, and asserts in its section seven that fossil fuel companies conspired to spread misinformation downplaying its harm just like tobacco companies downplayed the harm of smoking. 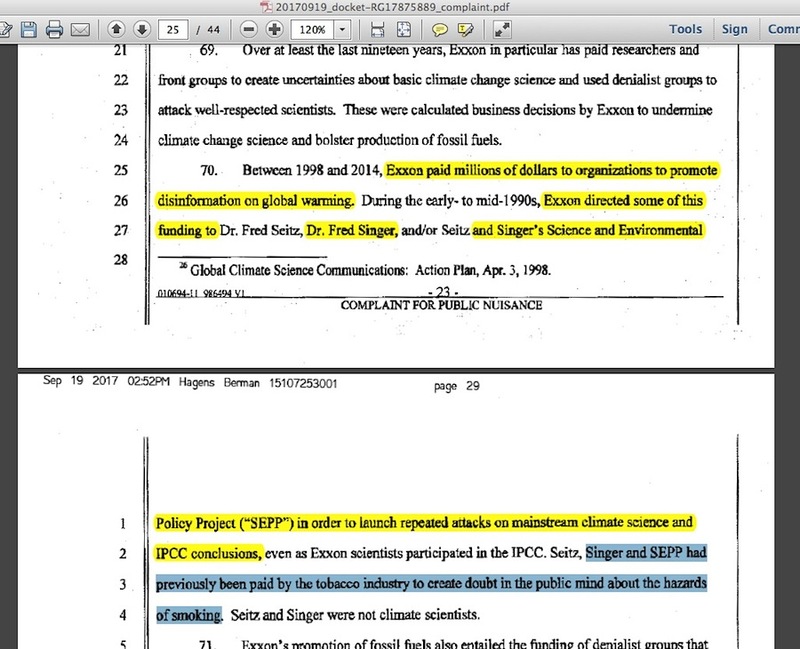 Dr S Fred Singer is offered as evidence of the fossil fuel / tobacco connection (a potentially slanderous situation I detailed in my March 15, 2018 blog post). 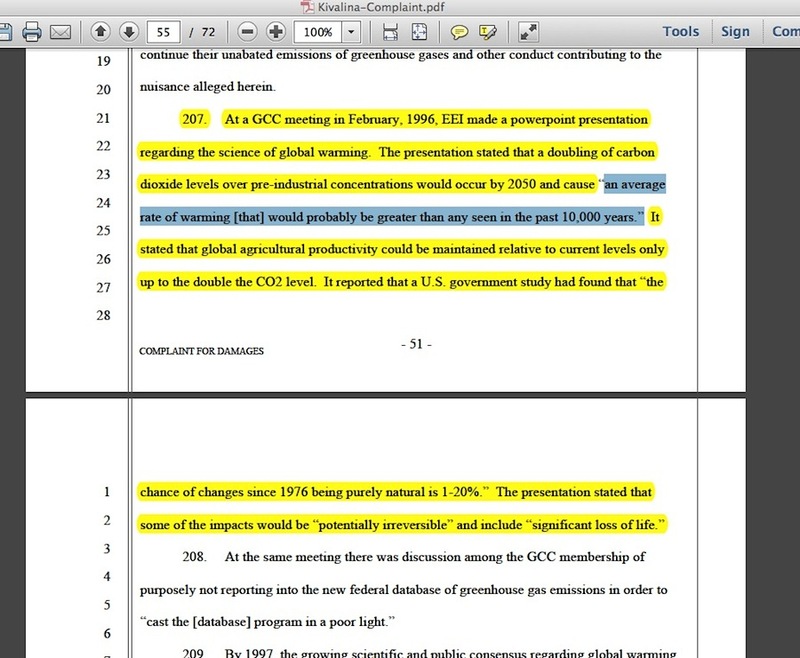 To support that assertion, the cases claim the GCC pushed public “contrarian theories about global warming,” yet internally believed those were not “convincing arguments,” and later supposedly dropped that latter “inconvenient conclusion” ……. while offering no source for those specific quotes. 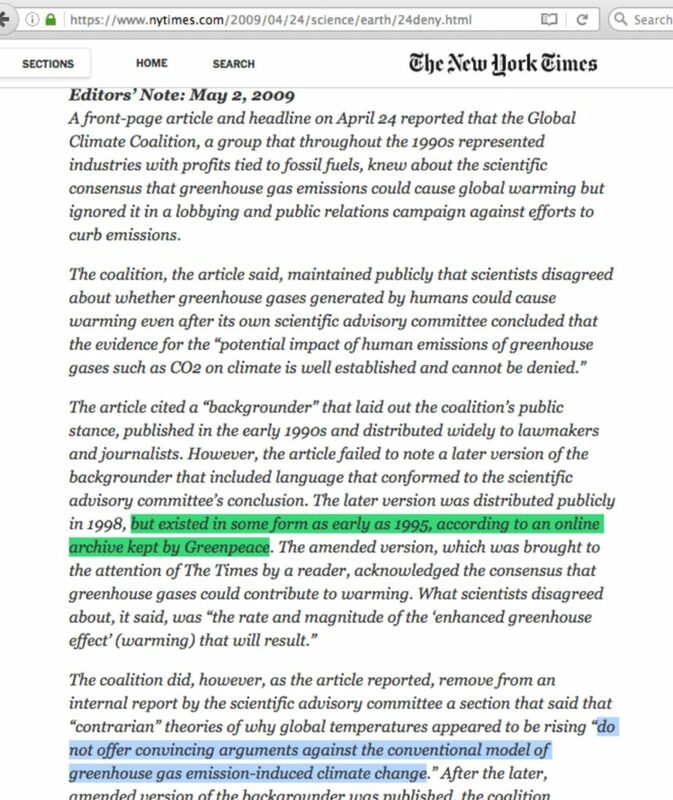 A 2009 New York Times article specifically about the documents containing those quotes has subsequent editor’s notes saying how the documents were seen in Greenpeace archives (that “Greenpeace USA née Ozone Action” organization, which I term the epicenter of the smear of skeptic climate scientists). 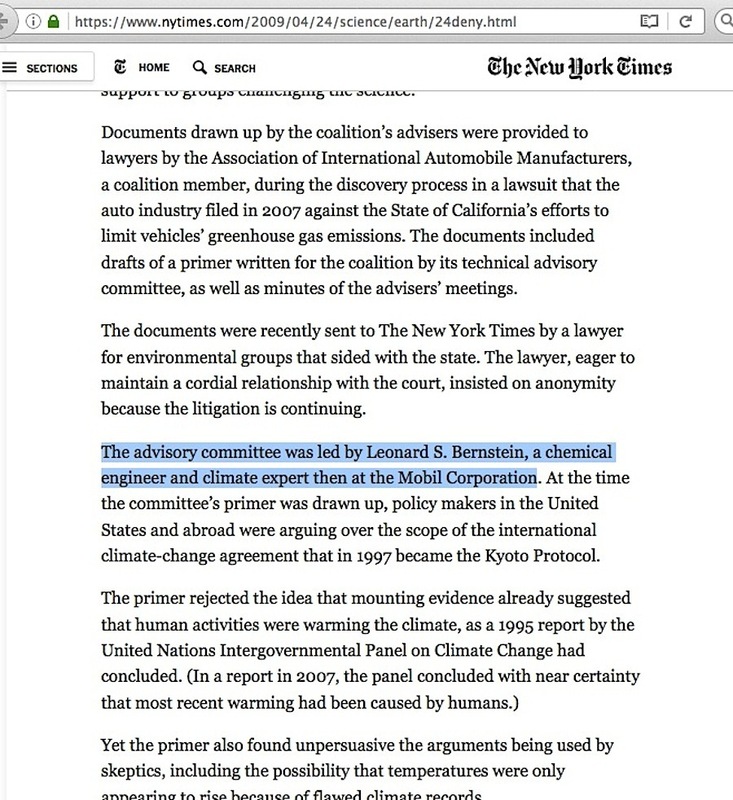 The NYT fortunately saved a copy of those docs, with the Bernstein name in the article seen on the second page and the “do not offer convincing arguments” in its conclusion. 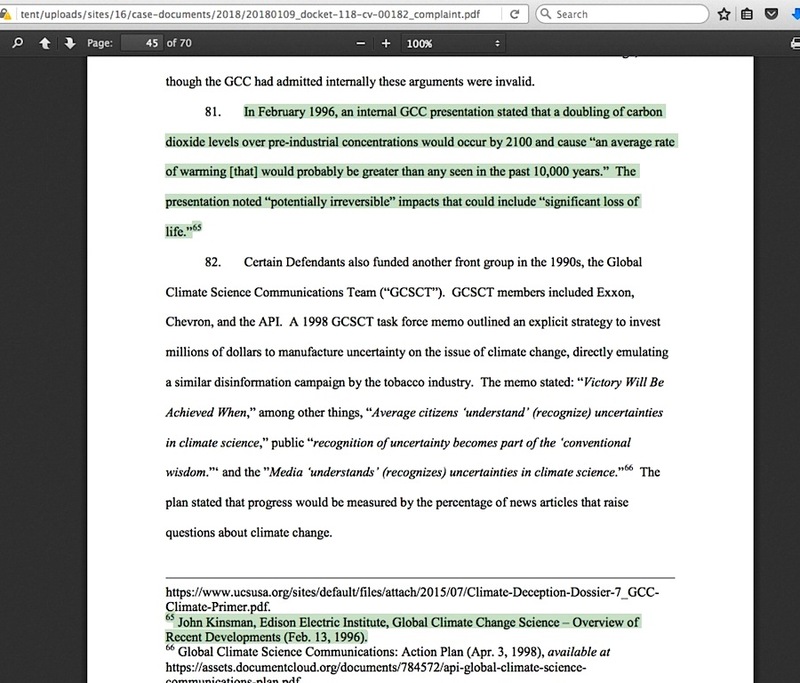 While it may be worthwhile to ask if the GCC ultimately did not drop skeptic climate scientists after seeing convincing skeptic arguments, a far bigger question to ask is this: Is it purely coincidental that Matt Pawa — of the Oakland / San Fransisco cases currently citing old GCC material — seems to have a potential appearance of being connected with the 2009 NYT GCC documents story? 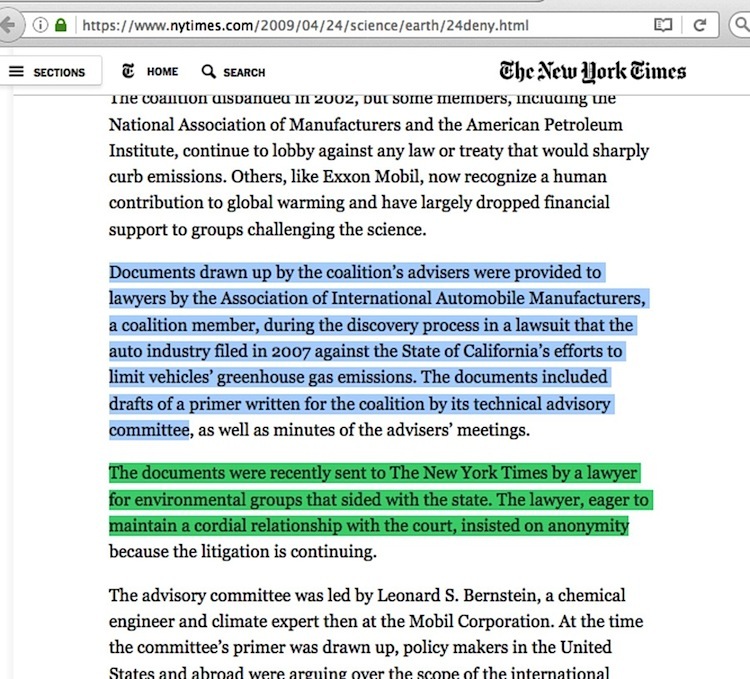 That story references the Association of International Automobile Manufacturers and the “discovery process” in a lawsuit which the “auto industry filed in 2007 against the State of California’s efforts to limit vehicles’ greenhouse gas emissions,” noting an anonymous lawyer forwarding what was discovered to the NYT. 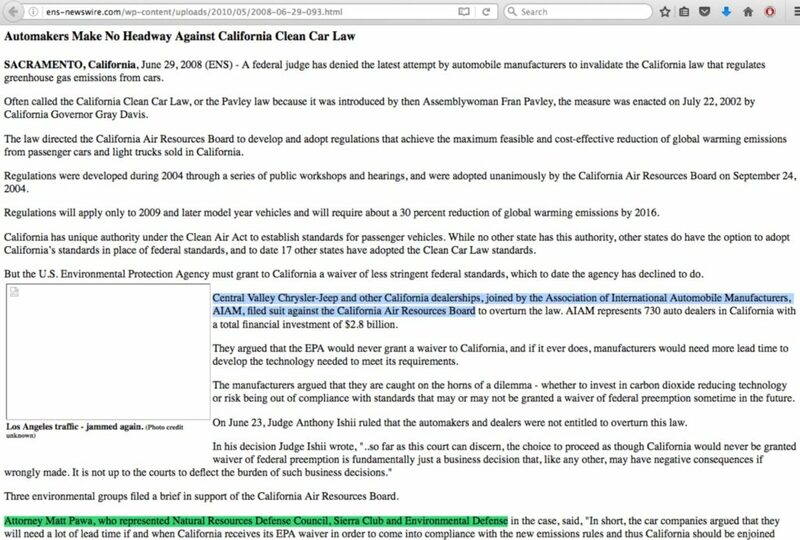 Apparently, that’s the situation described in this 2008 Environment News Service article about auto manufacturers suing the California Air Resources Board, where you can’t miss Pawa’s prominence in connection with his AIAM opponents. 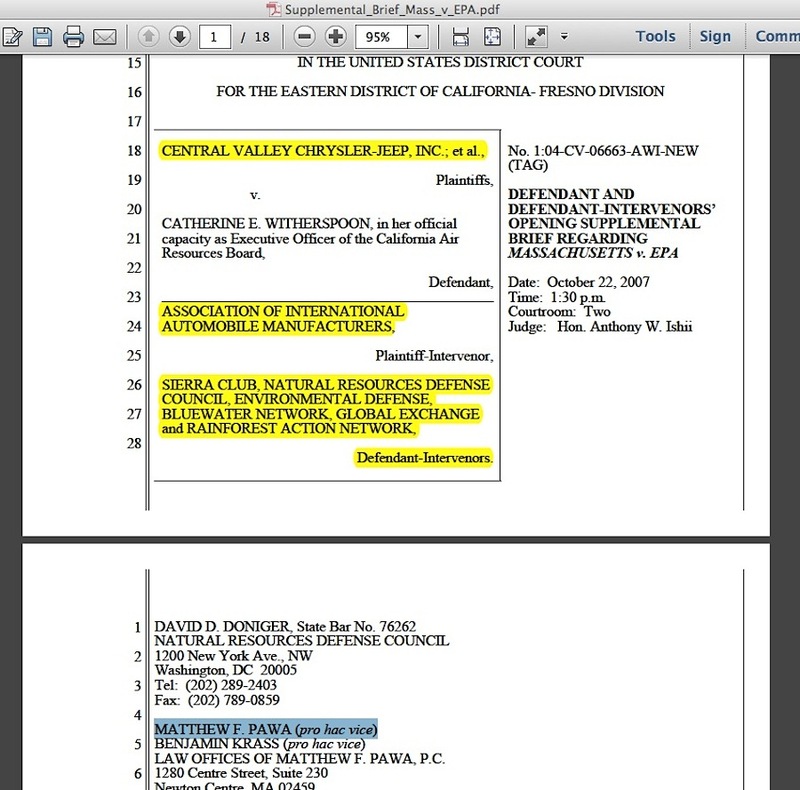 Dig deeper, and you find related items featuring Matt Pawa’s name in a lawsuit request to receive documents from the name variation of “Alliance of Automobile Manufacturers.” Then there is this court filing variation. 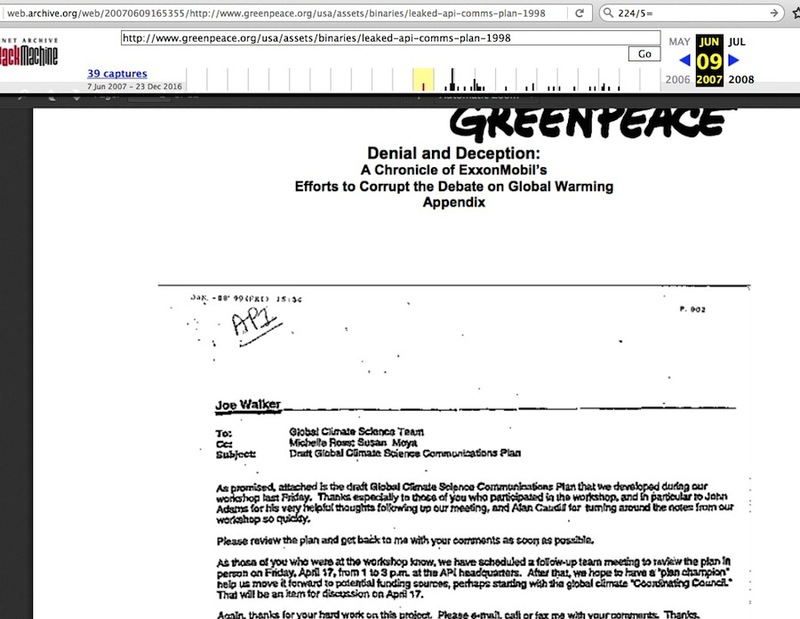 The results seem to have ended up to be page 1 in the NYT / Greenpeace documents collection. 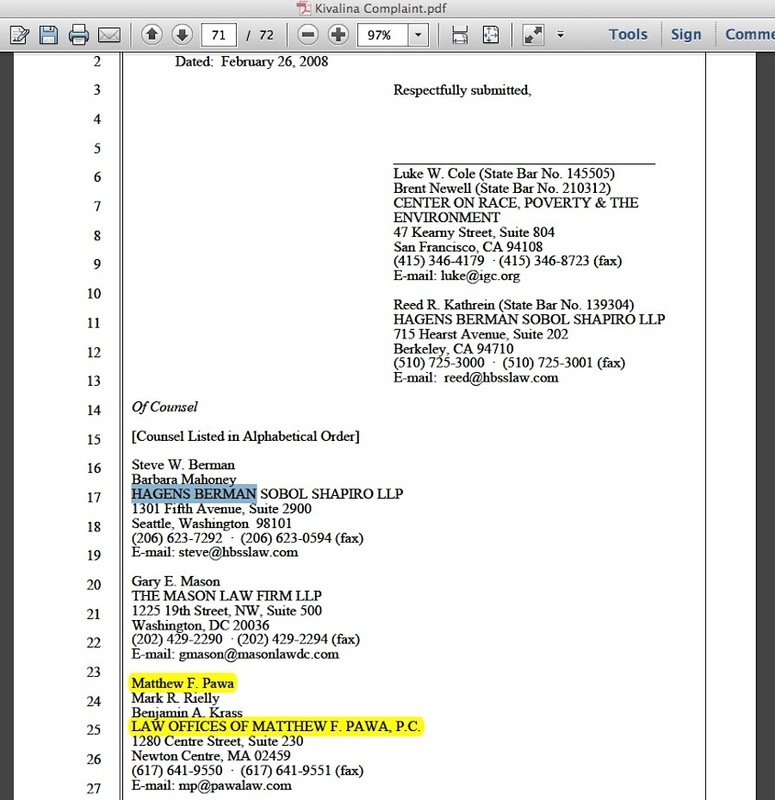 Ultimately, the biggest question about this NYT documents situation, in relation to the Oakland case not sourcing their origin, is whether the source is omitted in the Oakland case because Matt Pawa himself may actually be the source for the documents? 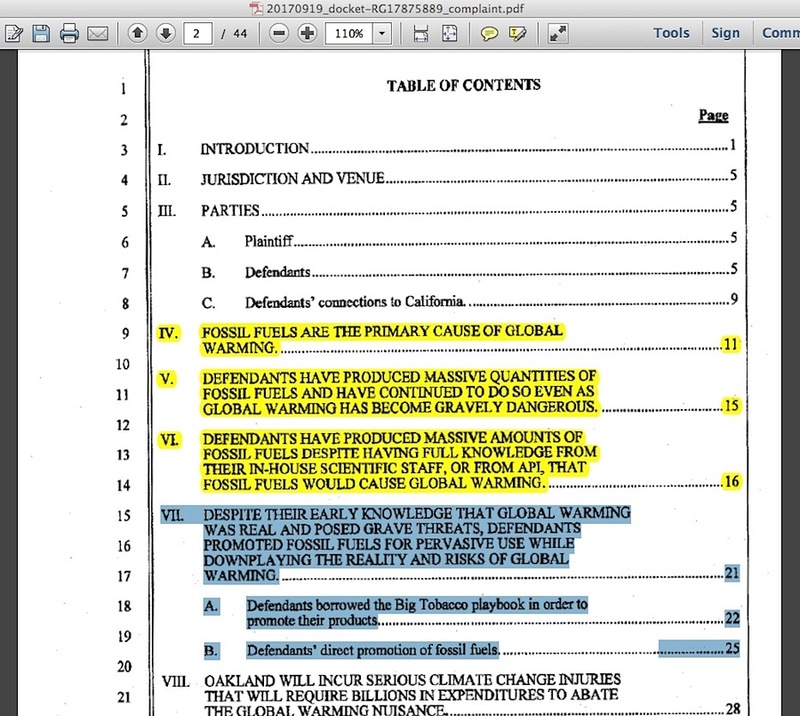 Things get worse from this point: the Oakland judge probably asked for Pawa and associates to provide the material for his item #9 tutorial request because there was only a vague citation reference about the “Global Climate Science Communications Team” (GCSCT), and nothing for the “February 1996 internal GCC presentation.” The judge ultimately didn’t ask about the GCSCT (I’ve described its central ‘smoking gun evidence’ claim to fame as being little more than a worthless truism which Greenpeace could use with minor rewording). 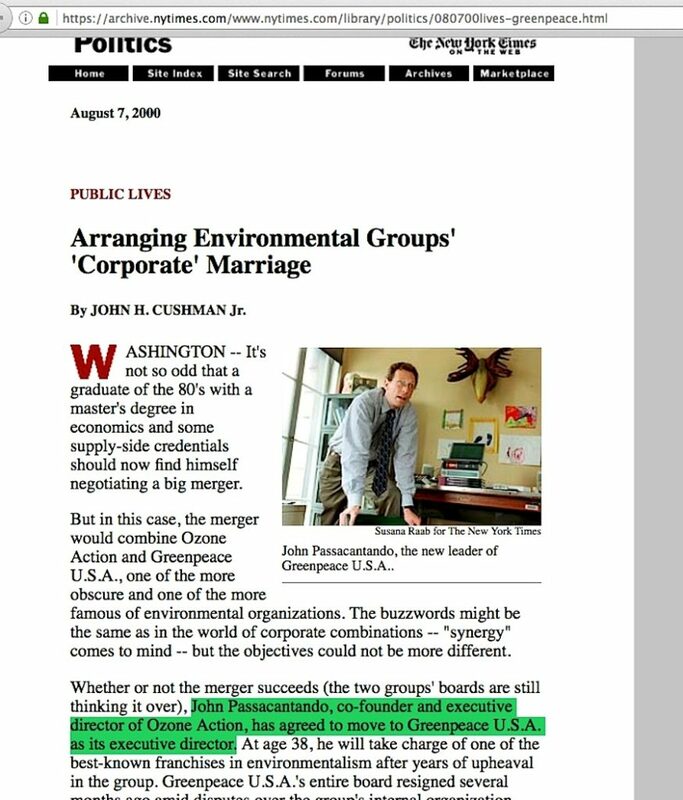 But was the vague source reference because Pawa didn’t want it known that the most famous longtime online source for the GCSCT memos was Greenpeace? …. 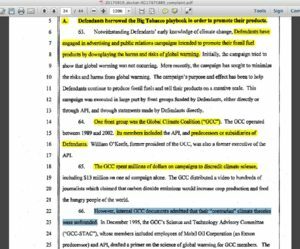 is potentially the killer of the lawsuit, and if more people fully comprehend his position, it could kill the entire notion of an ‘industry conspiracy to misinform the public about global warming.’ Why? because there’s nothing damaging in the “internal GCC presentation.” Prior to the judge’s tutorial hearing, I couldn’t find the “full GCC presentation” he was asking for anywhere on the internet. 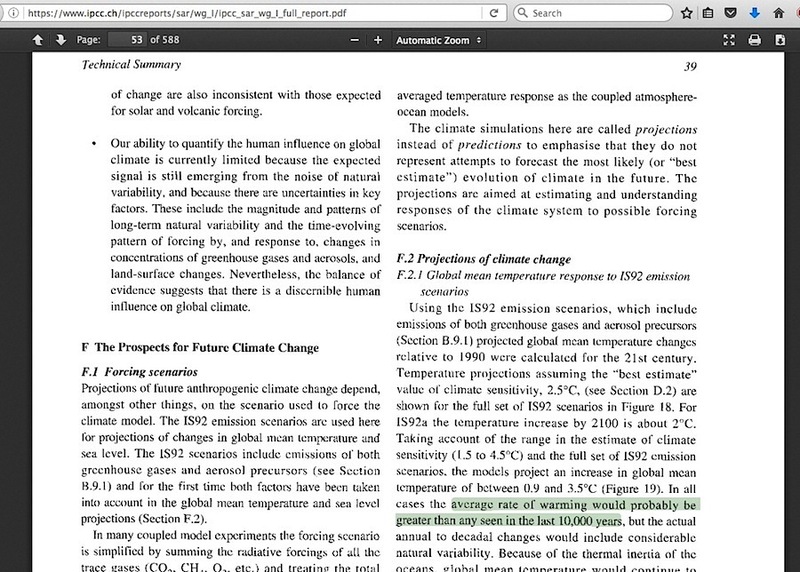 What I found, however, was that the main “10,000 years” sentence quoted in that old presentation basically matched a sentence within the IPCC Working Group I 1995 Report, “The Science of Climate Change” on page 20 and repeated on page 53. I also found Matt Pawa’s other references to it — but hold onto that thought for a few moments. THE COURT [to Chevron’s attorney Theodore Boutrous]: … I’ll give you two minutes if you wanted to say something about the documents. And I did read the documents carefully. So I am up to speed on what those two documents said. But I want to give you a chance to make your point on it. THE COURT: How could you have not seen them? 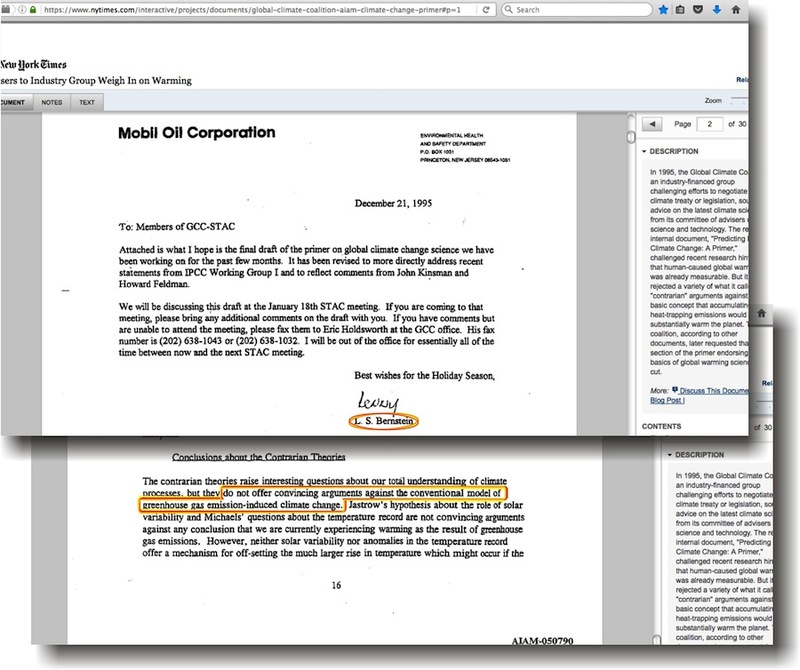 They were from maybe not Chevron files, but from the files of those organizations that Chevron has something to do with. MR. BOUTROUS: One person attended a meeting or participated in something. We just had not seen those documents. So it was helpful that the Court had them because I think they tell a different story than the Plaintiffs do. THE COURT: …. I found it useful, and I think Mr. Boutrous is correct. 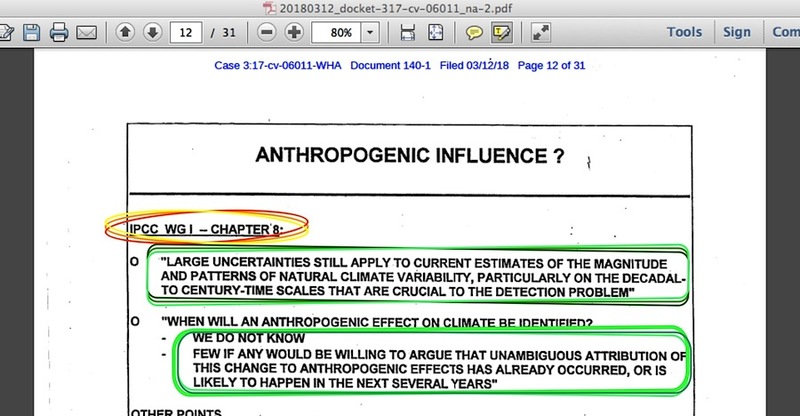 I read that paragraph 67 the same way; that there was a conspiratorial document within the defendants about how they knew good and well that global warming was right around the corner. And I said: “Okay. That’s going to be a big thing. I want to see it.” Well, it turned out it wasn’t quite that. 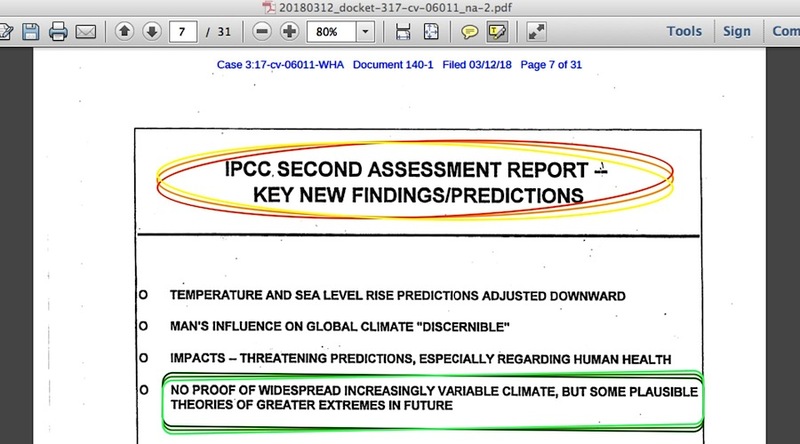 What it was was a slide show that somebody had gone to the IPCC and was reporting on what the IPCC had reported, and that was it. Nothing more. 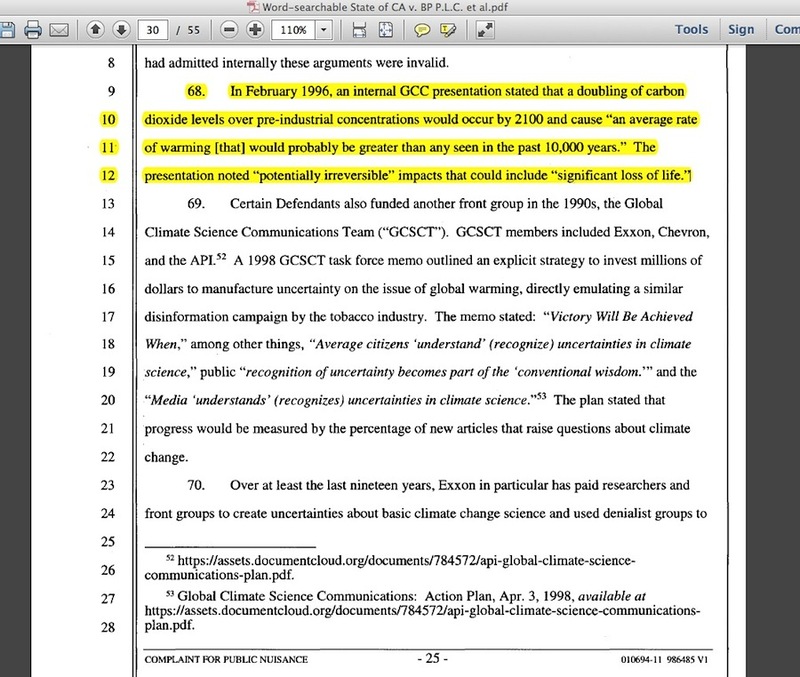 So they were on notice of what in IPCC said from that document, but it’s hard to say that they were secretly aware. By that point they knew. 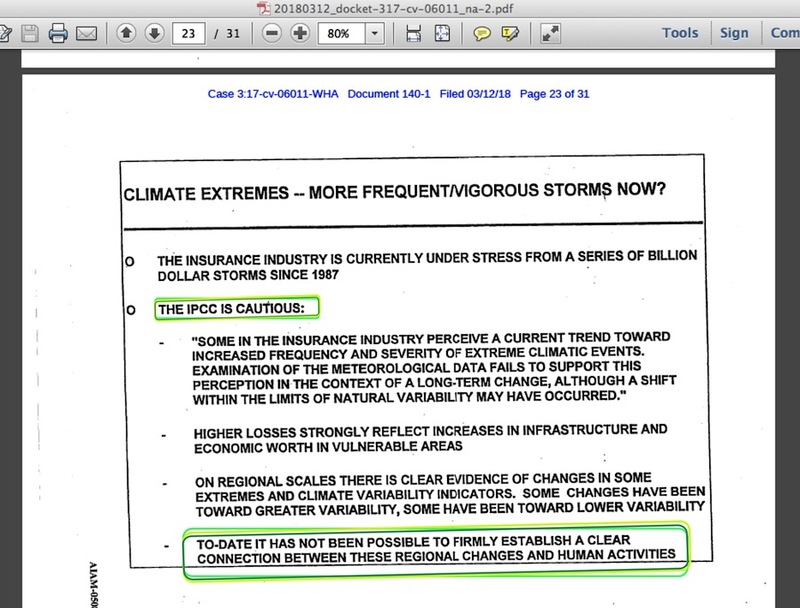 Everybody knew everything in the IPCC. So I don’t know. I think Mr. Boutrous makes a fair point. 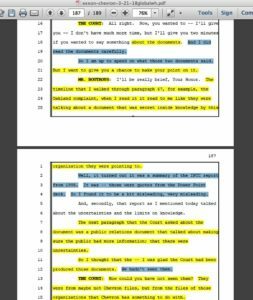 [the judge next addresses Steve Berman, attorney for the firm representing the California plaintiffs along with Matt Pawa] If you want to respond, I’ll let you respond. But I don’t know if that had as much to do with today, but if he wanted to respond okay. Anything you want to say? BAM! 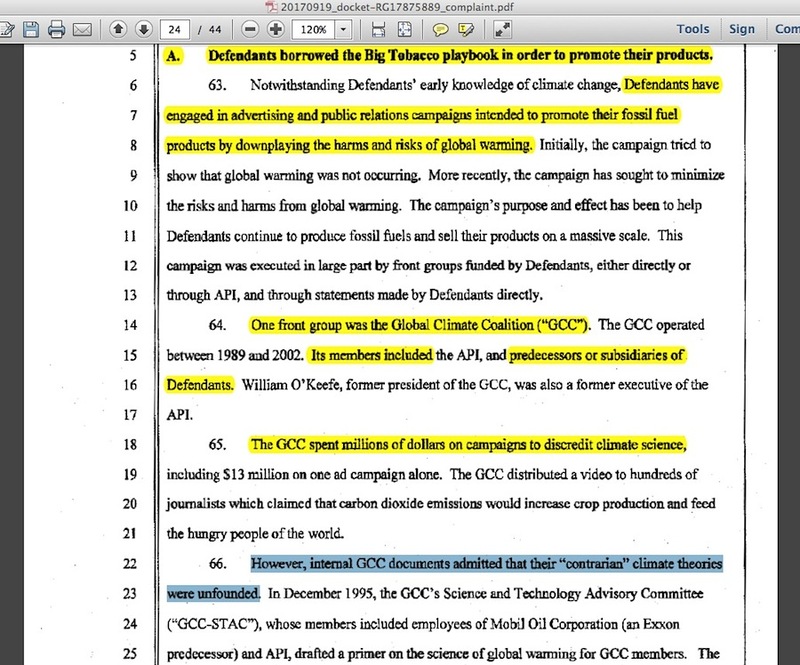 The judge rejects the GCC presentation in the case as evidence that there was a “conspiratorial document within the defendants about how they knew good and well that global warming was right around the corner,” and the plaintiff’s attorney offers nothing to dispute it. 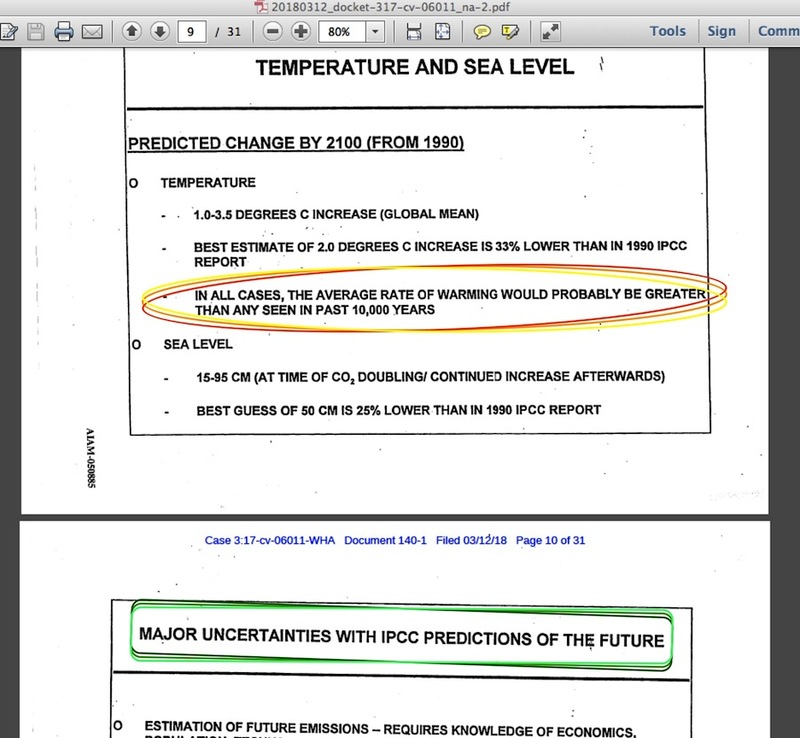 Clearly, it doesn’t show industry people ‘admitting to knowing the average rate of warming would probably be greater than any seen in the past 10,000 years,’ it was actually only reporting what the IPCC assessments said regarding that specific assertion. 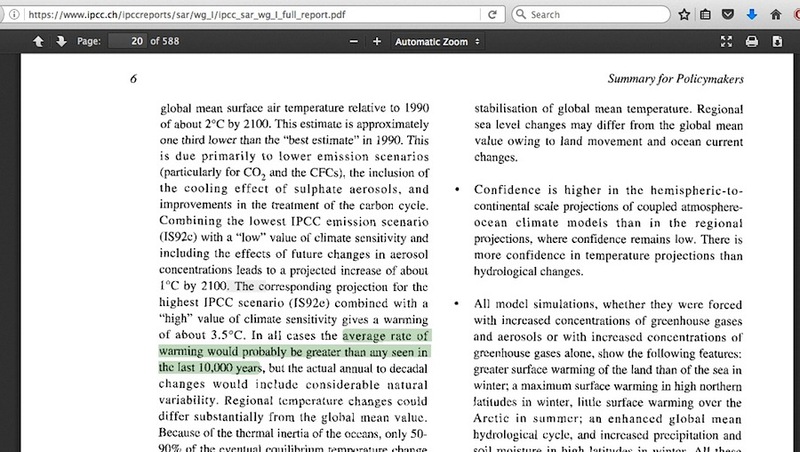 Far worse, the GCC presentation also showed the IPCC’s uncertainty about global warming. More than once. 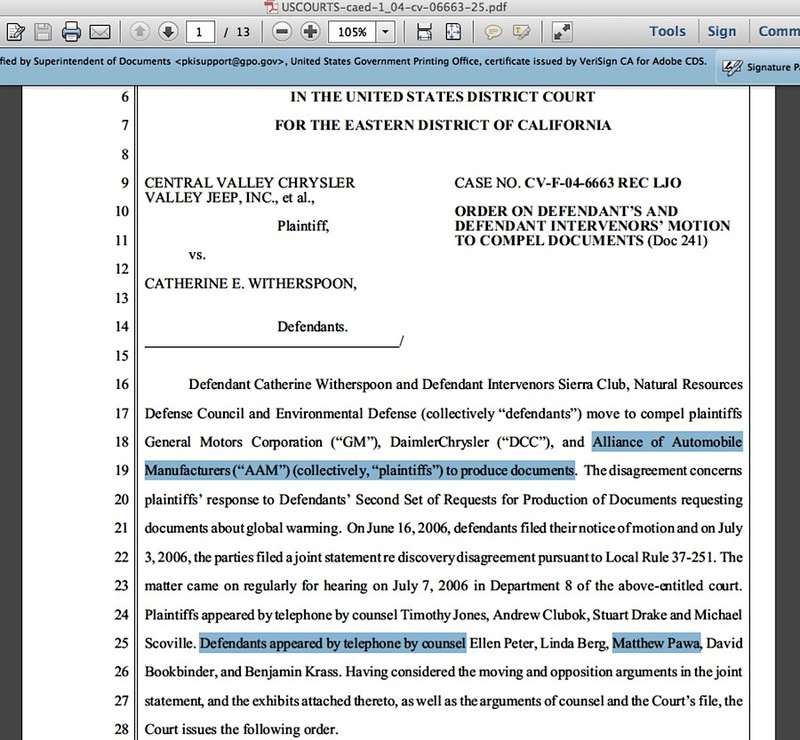 If this wipes out the conspiracy claim within the Oakland case, it destroys the identical claim in the twin San Francisco case by default, as well as the identical claim in the City of New York v. BP case, where Matt Pawa at least had the minor courtesy of saying where the “GCC presentation” came from. However, that isn’t the only place where Pawa pointed to that GCC presentation. 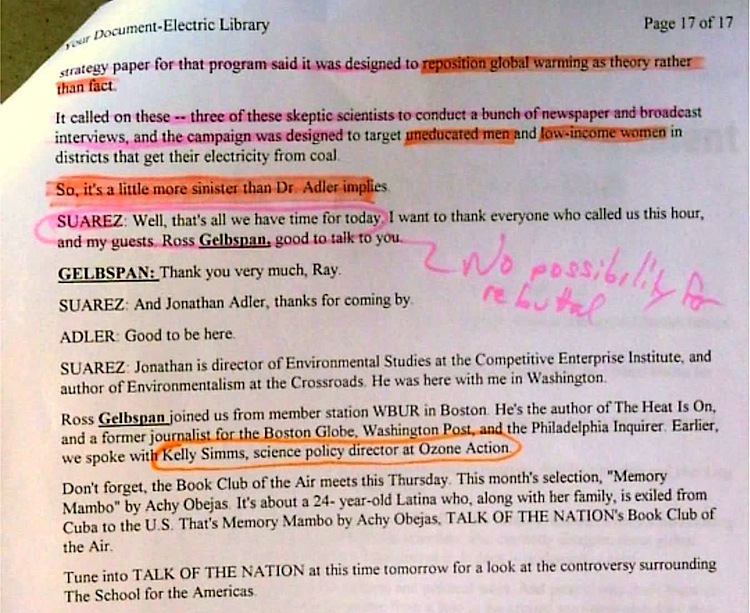 He offered it in his epic (but later dismissed) 2008 Kivalina v Exxon case, where he disclosed (sans source for it) that it was an Edison Electric Institute powerpoint presentation. 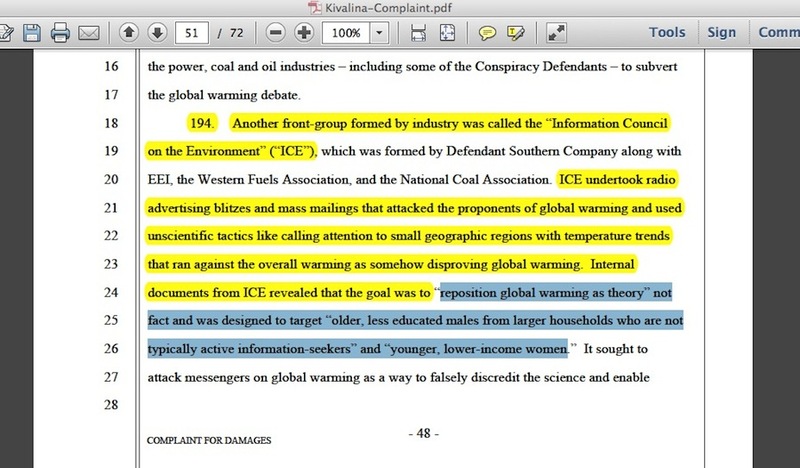 This was the same lawsuit where Pawa also used the infamous subset of ‘leaked ICE campaign memos’ having the strategy to “reposition global warming” (with its tortured citation sources for them) to insinuate an industry conspiracy to spread misinformation and lies. 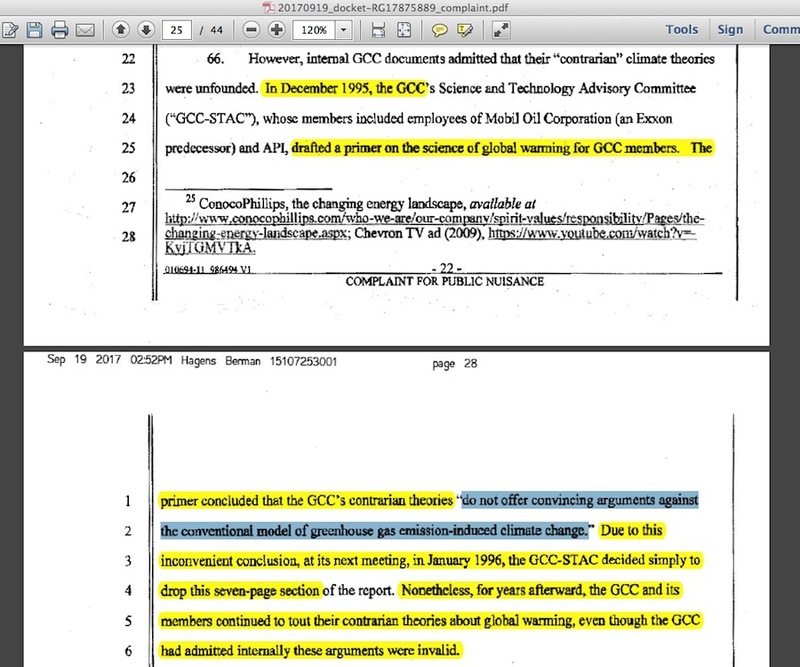 To say this memo subset is as out-of-context as the GCC presentation is an understatement; it was never actually a component of what accusers say it was, and therefore is worthless as evidence to prove the fossil fuel industry conspired with skeptic scientists to downplay the alleged catastrophic environmental harm of fossil fuels. 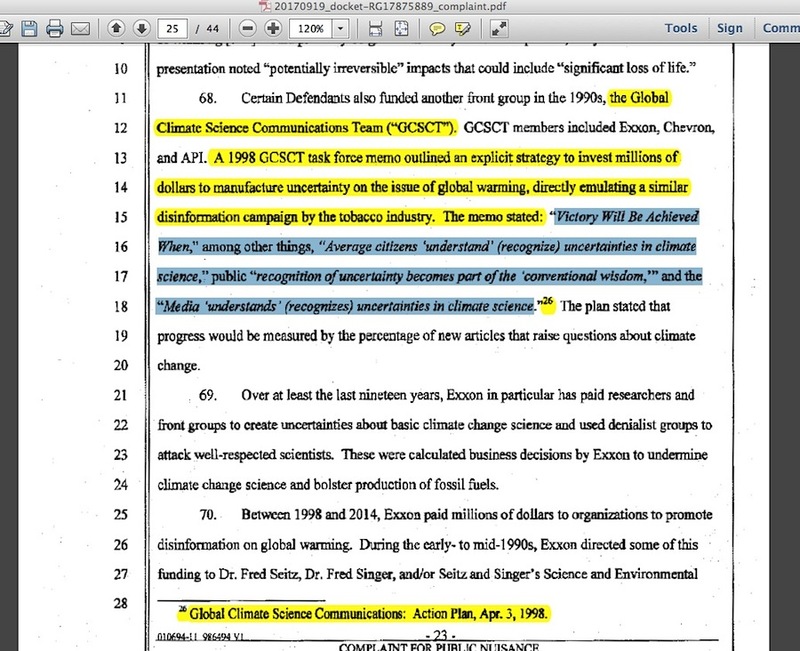 Drag Exxon’s officials and their lawyers into a courtroom to face Al Gore’s accusation about them having this strategy, and they’d say they never heard of it, just like the Chevron lawyer did in this case. 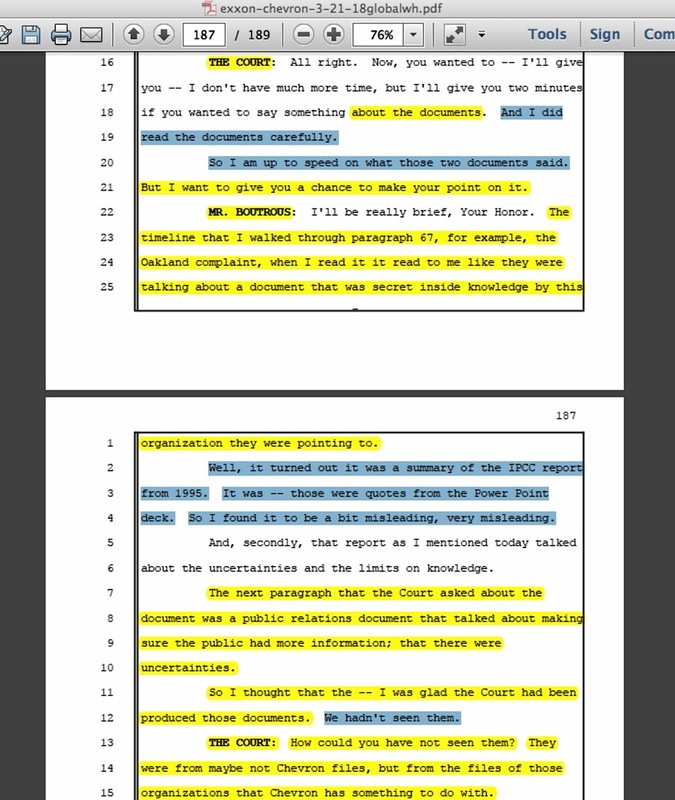 Fail to establish that any such conspiracy exists because the evidence for it is worthless, and a distinct problem arises: the main people behind these cases may be compelled to explain why they didn’t know the evidence was totally without merit ….. and/or whether they knew it was worthless the entire time. 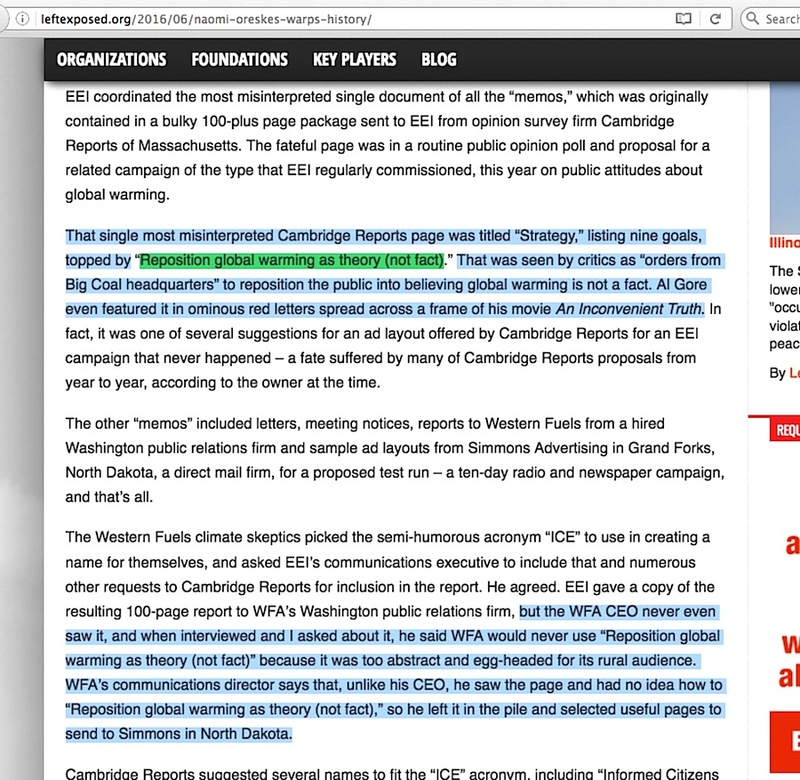 This entry was posted in Global Climate Coalition, Global warming lawsuits and tagged Hagens-Berman-Pawa, Matt Pawa by Russell Cook. Bookmark the permalink.